Removing stubborn stains and grime outside your house can cause you a lot of stress. Some cleaning products and methods may never be enough to do the job. However, no one wants a home that looks old and dirty. So what can you do to get your home looking as good as new? Hire professionals on pressure washing services in Massillon, OH. At Wilhelm Power Washing, we commit ourselves to giving clients utmost satisfaction. 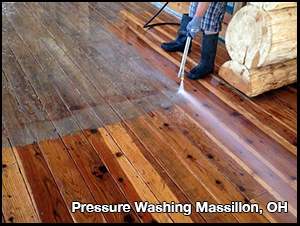 Our company has been providing pressure washing services to Massillon, OH residents since 1973. Randy Wilhelm, our founder, personally trained all the employees in our company. As such, we guarantee that under our hands, your home will always get the perfect wash.
Wilhelm Power Washing doesn’t let amateurs do pressure washing services on Massillon, OH homes. Backed by more than 40 years of experience, we know what to do to keep our clients satisfied. Our fully trained employees have the skills and expertise to do pressure washing in Massillon, OH without fail. We guarantee that your home will look as good as new by the end of the day. Some companies offer pressure washing in Massillon, OH for a lower price but their quality of work might not meet your standards. At Wilhelm Power Washing, our fully trained employees have mastered pressure washing services for Massillon, OH homes. We know what to do and get our job done right. Hiring Wilhelm Power Washing for pressure washing services on Massillon, OH homes is a better option than spending time and money doing it yourself. As experts on pressure washing services in Massillon, OH, we can do all the dirty work for you while you focus on other things in your life. Inexperienced workers who perform pressure washing services for Massillon, OH homes can cause more damage than cleaning. With Wilhelm Power Washing, you will never encounter broken windows or cracked pathways. We handle pressure washing services on Massillon, OH meticulously and with care. People realize the stark difference once we start doing our pressure washing services for Massillon, Ohio homes. Unlike other companies, Wilhelm Power Washing’s pressure washing services in Massillon, OH doesn’t mean we just rinse houses down. We pay attention to detail and wash every nook and cranny of your home. As experts on pressure washing services in Massillon, Ohio, we know which tools and products are best suited for each area outside your home. We understand that carelessly using second-rate cleaning products can do more harm than good. Wilhelm Power Washing’s pressure washing services in Massillon, Ohio give your house a deep clean without damaging any of your property. If you’re on the lookout for experts on pressure washing services in Massillon, OH, turn to Wilhelm Power Washing. Experience the difference with Ohio’s premier power washing company. To learn more about our pressure washing services for Massillon, OH homes as well as our other services, contact us today. You can give us a call at 330-477-7094 or email us at dwilh51183@yahoo.com. We look forward to serving you. With pressure washing, all the dirt and grime on your property will be washed away. Using high pressure water blasts, heat, and soap, we can make your home look brand new. We don’t use just any soap either; we utilize a safe, environmentally friendly, and biodegradable cleaning solution that not only removes stubborn stains but also keeps mold from returning!